For those too young to remember the Bay Area 40 years ago, it’s hard to imagine the mostly clear skies that Bay Area residents enjoy today filled with choking smog from factories, cars and garbage fires. The Bay Area’s population has nearly doubled since then, to more than 7 million people. But the region’s air has become steadily cleaner. In 1969, there were 65 days when Bay Area air quality exceeded federal health standards. Under those same standards, last year, there wasn’t a single day over the limit. The reason? The Clean Air Act. 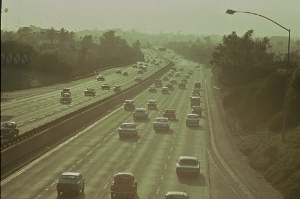 One of the nation’s cornerstone environmental laws, the Clean Air Act turns 40 this week. Sort of. Although Richard Nixon signed the law in December, 1970, the landmark legislation will be commemorated a bit early at an EPA conference Tuesday in Washington D.C. with a day of celebrations, speeches and public events around the country designed to highlight the public health and environmental benefits from the law. California has been ahead of the rest of the country in reducing smog. Because of the state’s large population and hot weather, state lawmakers approved the first air pollution regulations in 1946. Since then, California was first to require smog checks for cars, first to ban leaded gasoline, first to require catalytic converters on cars. The Clean Air Act tied all the state rules together. It required the federal government for the first time to set standards for six major types of air pollution: soot, carbon monoxide, lead, nitrogen oxides, sulfur dioxide and ground level ozone, a major source of smog. 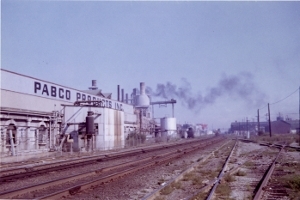 The law ushered in a wave of state and federal standards, from scrubbers on smokestacks to the phase-out of leaded gasoline. Some of the results are dramatic. New cars sold today, with computerized emission systems and other high-tech devices, emit 99 percent less tailpipe pollution than cars sold in 1970. But the job isn’t done, say health experts and air regulators. Federal standards have become more stringent, resulting in 13 days last year when the Bay Area exceeded the new national standard for ground-level ozone. Meanwhile, the pollution from trucks and other diesel-powered equipment, called particulate matter (PM), has until recently largely flown under the radar. Tiny diesel soot particles are inhaled deep into the lungs and have been shown to cause life-shortening health problems ranging from respiratory illness to heart problems, asthma, and cancer. The California Air Resources Board estimates that diesel soot from ships, trains and trucks causes as many as 2,400 premature deaths statewide each year. In fact, a recent Air District study concluded that exposure to particulate matter of 2.5 microns in width and smaller (PM 2.5) is by far the leading public health risk from air pollution in the Bay Area, accounting for more than 90 percent of premature mortality related to air pollution. “We have done a great job of reducing smog levels here in the Bay Area. But there are these communities in and around the Bay Area that still of course, we believe, experience elevated levels of toxic air contaminants,” said Broadbent. 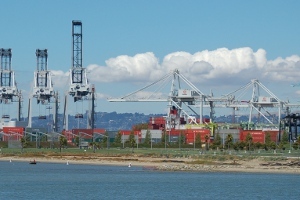 The Air District has identified several “hot spots” or communities at much higher risk of exposure to dangerous levels of diesel particulate and other types of air pollution including Richmond, the West Oakland/ Berkeley corridor and Bayview Hunter’s Point. Local, state and federal rules have begun to address particulate pollution. In 2006, the EPA mandated the use of ultra-low sulfur diesel fuel. California has also required that all ships within 24 miles of California ports to burn low-sulfur fuel. But Denny Larson of the environmental justice organization, Global Community Monitor, says that while these regulations are a move in the right direction, thousands of toxic air contaminants remain unmonitored and under-regulated in the Bay Area. The latest frontier in air regulation is in greenhouse gases. Both the state Air Resources Board and the Bay Area air district are in the process of writing new regulations to control and reduce emissions of greenhouse gases. Because transportation is still California’s largest source of carbon dioxide, with passenger vehicles and light duty trucks creating more than 30 percent of total climate change emissions, state lawmakers in 2002 passed a new law requiring all new cars sold in California to reduce greenhouse emissions 30 percent by 2016. And nationally, the EPA plans to significantly expand the scope of the Clean Air Act to regulate greenhouse gas emissions from factories, power plants and other industrial source starting next year. But the new approach is controversial. Some business groups have argued that clean air laws already are costly for industry, and that a new layer of climate change regulation, particularly in a bad economy, will cost jobs. Proposition 23, on California’s November ballot, would suspend AB 32, the state’s landmark greenhouse gas law, until unemployment falls to 5.5 percent for a year. Watch QUEST TV’s Asthma: What Brought on the Epidemic? Federal officials today are marking a milestone in the fight to clean up the nation’s environment. Forty years ago, Congress passed the Clean Air Act. The law aimed to tackle the impact of air pollution from cars, industry, and other sources by setting the first nationwide limits on pollutants. Since then, levels of toxic pollutants like lead, ozone and carbon monoxide have dropped dramatically. But the victory hasn’t been complete. Particulate pollution from diesel fuel still represents a widespread health risk and battles are still ahead as regulators take on the task of cutting greenhouse gas emissions. Host Kelly Wilkinson talks about the impact of the Clean Air Act and the pollution challenges ahead with Amy Miller, reporter and producer for KQED’s Quest science and environment program.